“Correcting ISKCON’s Guru System”—My first comment is: the title you have chosen is misleading; it is not ISKCON’S GURU SYSTEM. The title should be “Prabhupada’s system for future initiations in ISKCON”. Being enlivened by so many thought-provoking observations and concepts on the subject of guru-tattva and the ISKCON institution I feel inspired to express some ideas and understandings on this issue. Srila Bhaktivinoda Thakura, while reviving Sri Chaitanya Mahaprabhu’s Sankirtana movement, realized that the massive task of spreading Krishna Consciousness all over the world, in every town and village, would not be possible without the collective endeavors of committed devotees for generations to come. Therefore he saw the need for an institution, and gave the blueprint of that institution in the form of his “Namahatta” (the market place of the holy name) and “Visva Vaisnava Raja-Sabha.” (the Royal Assembly of the Vaisnavas from All Over the World). Srila Bhaktisidhanta Sarasvati Thakura gave a shape to that concept in the form of his “Gaudiya Matha” and when that institution fell apart, Srila Prabhupada revived the spirit of his Guru Maharaja through ISKCON. It is important to note that Srila Bhakti Vinod Thakur, Srila Bhaktisidhanta Sarasvati Thakura and Srila Prabhupada, all three of them, gave more importance to the institution than to their own authority – in spite of being the founders and organizers of their institutions they placed themselves as ordinary members of their respective institutions. For example, Srila Bhaktivinoda Thakura indentified himself as the sweeper of the Namahatta. Srila Bhaktisidhanta Sarasvati Thakura called himself the servant of the Gaudiya Matha, and Srila Prabhupada identified himself as a mere member of the Governing body of ISKCON. Of course Prabhupada displayed the example of “being a mere member of ISKCON” to teach us humility. He nevertheless adamantly insisted that “Founder-Acharya of ISKCON” be prominently displayed on the cover of his books. He furthermore instructed, “I wish that each and every temple be independent, keeping the Acharya in the center.” Just like Krishna played the perfect friend, messenger, chariot driver, family member, hen-pecked husband and lover while on earth; still, in Bhagavad-gita He demanded that everyone surrender to Him, because He is the supreme personality of Godhead. In the final moments of Prabhupada’s life, he issued his all-important and final instructions for continuing initiations in ISKCON by naming 11 RITTVIK REPRESENTATIVES OF THE ACHARYA. By ignoring this final prescription of the Acharya, disaster has befallen ISKCON, and will continue to fall until it is perfectly and unhesitatingly obeyed by one and all ISKCON devotees. [Bhakti Caru’s essay continues:] Although Srila Prabhupada spread Krishna Consciousness all over the world within the amazingly short span of ten years time, he knew that he would not be able to spread it in every town and village during his lifetime; rather, it would take generations to achieve that. That is why he was so emphatic about the effective continuity of his mission through his ISKCON. Personalities such as Srila Bhaktivinoda Thakura, Srila Bhaktisidhanta Sarasvati Thakura and Srila Prabhupada come to grace this world only once in a blue moon. It is Sri Chaitanya Mahaprabhu’s causeless mercy that those three personalities came in such a succession. Their appearances on this planet was actually Sri Chaitanya Mahaprabhu’s divine arrangement for reviving His Sankirtana movement and fulfill His prediction that Krishna Consciousness movement would spread in every town and village on this planet. Although, being empowered by Sri Chaitanya Mahaprabhu, they could achieve anything and perform incredible miracles, yet, for the sake of fulfilling the ultimate purpose of Sri Chaitanya Mahaprabhu’s mission they emphasized the collective continuity of the movement through an institution. It is the King who makes the kingdom; not the kingdom that makes the King. Prabhupada made ISKCON; not ISKCON made Prabhupada. Don’t try to subvert Srila Prabhupada to suit your rules of the institution. The last presciption of the doctor takes precedence over all other prescriptions before it. The patient cannot quote the medical books to contradict the diagnosis and prescription ordered by the doctor. The prescription to ACT AS RITTVIK REPRESENTATIVE OF THE ACHARYA is the premise which Prabhupada emphasized and established by writing the July 9th letter for the COLLECTIVE CONTINUITY of the ISKCON institution. HOW CAN YOU EXCLUDE, OR IGNORE THIS ALL IMPORTANT AND FINAL PRESCRIPTION, GIVEN BY THE ACHARYA FOR THE COLLECTIVE CONTINUTY OF THE ISKCON INSTITUTION, to “ACT AS RITTVIK REPRESENTATIVE OF THE ACHARYA”? It is not mentioned a single time in your whole presentation. Why? Why has “RITTVIK REPRESENTATIVE” become a dirty word in ISKCON? It is not something invented by others. It was introduced by Srila Prabhupada, the Sampradaya ACHARYA. [Bhakti Caru’s essay continues:] Srila Bhaktisidhanta Sarasvati Thakura was an extremely brilliant personality who attracted countless luminaries of his time within the fold of his Gaudiya Matha. However, soon after his disappearance when the Gaudiya Matha disintegrated, in spite of all those luminaries the propagation of Krishna Consciousness practically stopped. Srila Prabhupada explained that, that happened because most his prominent followers could not understand the importance of continuing his mission through the institution he established. They held on to the traditional concept and concluded that a spiritual heritage could not effectively continue through an institution managed by a bunch of mundane managers, they defied the instruction of their spiritual master and appointed an acharya [who eventually fell down] the institution that he so meticulously structured collapsed. Srila Prabhupada, in order to protect his ISKCON from such an unfortunate possibility, emphatically told us not to make the same mistake that his god-brothers made after his Guru Maharaja’s disappearance. He advised us to continue the mission under the authority of a collective management structure. Nevertheless, after Srila Prabhupada’s disappearance, we in ISKCON also made a similar mistake. Thinking that Srila Prabhupada had appointed 11 successors we also plunged in to the same syndrome of appointing spiritual heads of the institution presuming that after Srila Prabhupada’s disappearance they inherited ISKCON. Now here, why do you avoid quoting Srila Prabhupada’s all important, simple and clear written instructions to the whole of ISKCON, APPOINTING 11 SENIOR MEN TO “ACT AS RITTVIK REPRESENTATIVE OF THE ACHARYA”, along with three subsequest supporting letters, two to myself (Letter to Hansadutta, 10 July 1977 and Letter to Hansadutta, 31 July 1977) and one to Kirtananada Swami? [Bhakti Caru’s essay continues:] In 1987, about 10 years after Srila Prabhupada’s disappearance, this mistake was addressed by concerned leading devotees of ISKCON, but was not fully corrected. Just by adding more gurus and allowing them to initiate wherever they could attract disciples, that mistake was only diluted to some extent but was not really corrected. Actually, the mistake was not diluted. The mistake was compounded! By adding more gurus, the mistake was magnified exponentially. [Bhakti Caru’s essay continues:] Recently, the GBC body became painfully aware that through that mistake a parallel line of authority has been created in ISKCON which is causing a considerable amount of damage to the institution and is stifling the growth of the movement. It is very laudable of the GBC body that they have taken this issue very seriously and are working hard to rectify it. You make it sound like the GBCs are working hard, like prisoners in a Russian GULAG. All the hard work has long ago been done by Srila Prabhupada. It was Prabhupada at the age of 70 years who came to America. It was Prabhupada who painstakingly translated and wrote 60 books. It was Prabhupada who empowered thousands of hippies, freaks, acid heads, lunatics and losers to go to all parts of the world and open and build temples and centers, and they then consequently recruited thousands more meat heads, drug addicts, women hunters, gamblers and goons. When the dust settled and Prabhupada was preparing to leave, senior disciples gathered around him in Vrindaban with the all-consuming important question on their minds: “WHO IS GOING TO BE THE GURU? WHO, HOW, WHERE AND WHEN CAN WE BE GURUS?” That was what everyone wanted to know. In the July 9th, 1977 letter Srila Prabhupada gave the answer. It was his last PRESCRIPTION, naming 11 disciples to ACT AS RITTVIK REPRESENTATIVES OF THE ACHARYA. “HENCEFORTH”,”WHOEVER IS NEAREST”—not DEAREST (as Srila Sridhara Swami interpreted it). “If you change ONE LETTER, THE WHOLE THING WILL BE SPOLILED”. NEAREST was changed to DEAREST, and the rest is history. THE TWO ESSENTIAL ELEMENTS ARE DISCIPLINE and OBEDIENCE TO THE ORDER OF THE FOUNDER-ACHARYA, SRILA PRABHUPADA. Discipline means disciple, and disciple means WHO VOLUNTARILY OBEYS THE ACHARYA. [Bhakti Caru’s essay continues:] The head of the institution and its management structure. In ISKCON we have to be absolutely clear that Srila Prabhupada is the head of the institution and he will continue to be that as long as the institution lasts, and the management structure Srila Prabhupada established – the GBC, temple presidents, departmental heads, etc, must be fully functional without any deviation. If we compare the institution of ISKCON to a corporate structure, then we must recognize that Srila Prabhupada is the proprietor of ISKCON, and the other leaders of this institution are the managers. The managers manage, and although they get their remunerations and incentives for that, the profit belongs to the proprietor. Primarily everyone is a DISCIPLE first, under voluntary obediance, and DISCIPLINE. Then [next consideration is whether] he is either a GBC, RITTVIK, COOK, SANKIRTAN MAN, PUJARI, MECHANIC, MANAGER, MAN, WOMAN OR ANIMAL, ETC. I dont remember anyone getting remunerations (as in salaries many are now receiving) for their service to Prabhupada. 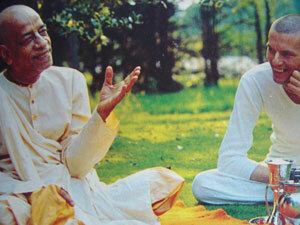 It is not enough to recognize Prabhupada. More importantly, we have to OBEY PRABHUPADA. If you really believe that Prabhupada is the CREATOR, MAINTAINER, AND ENJOYER of ISKCON (bhoktaram yajna-tapasam sarva-lok-mahesvaram…) then what is the difficulty in accepting Prabhupada’s prescription to ACT AS RITTVIK REPRESENTATIVE OF THE ACHARYA? Shout it from the roof tops and be proud of it. Why the persistent ignorance (deliberately ignoring) of Srila Prabhupada’s final instructions? Give one good reason for this all-pervading ignorance in the matter of following Srila Prabhupada’s written prescription to all of his disciples at the 11th hour of his life. [Bhakti Caru’s essay continues:] …then only this mistake that is stifling the growth of our institution will be rectified and Krishna Consciousness movement will start to spread once again, all over the world, in leaps and bounds. It will be easy to dismiss what I have written. I am, after all, the worst offender—that is admitted by me. Still as a friend I am writing you, not as a competitor but in the spirit of Prabhupada. Wonder, beautiful because it is honest and true. As is your name, Hansadutta das..